While most visitors choose the hot summer months to visit Prague, the rewards of bearing the cold of the winter season are great - if you cherish the Christmas spirit! For those in Prague in the month of December will get to experience the beauty and magic of Prague's Christmas markets first-hand. With their many colourful stalls and decorations, as well as several gigantic Christmas trees, like the often snow-covered white Christmas tree of Old Town Square, the Prague Christmas markets are just the touch of Christmas spirit you've been missing since you were a little kid. You'll find both locals and tourists enjoying the markets, and there are plenty of treats for children and adults alike, from toys and candy to unique gifts and souvenirs, as well as the hot wine that's guaranteed to warm you up on even the coldest winter's day! Children can even enjoy a ride on a pony or pet sheep and goats next to the Bethlehem manger. At various times, you'll bound to hear both traditional Czech and more modern Christmas carols being sung throughout the markets. The 2010 festivities are scheduled to begin on the first of December and continue through the first of January. The markets run daily from 9 am to 7 pm, and the food and wine stalls generally stay open even later in the evening. 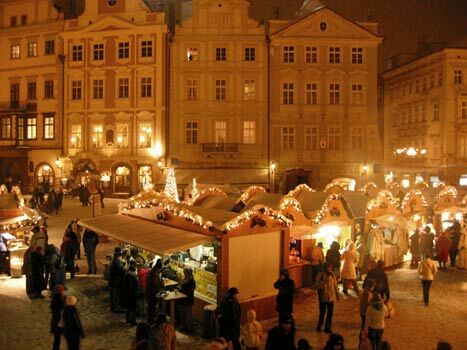 Prague's two main Christmas markets are based in the Old Town Square and at the end of Wenceslas Square. There are also smaller markets at Namesti Republiky and Havelske Trziste. You can find a range of traditional handicrafts in the stalls at the Old Town market, or stop by for some hot wine and warm food at both. Prague is indeed a wonderful city. I was there in October 2010 and I'll be back soon, have left too many beautiful places to visit. Hello! i was in Prague with boyfriend in 2007 i had best christmas ever in prague! I am not very interested in reading about Christmas Market 2007, when I already have visited their market of 2008 and would like to know about 2009. I was there in September, Prague is beautiful! A place everybody should visit! I loved it and so did my friends! Best trip ever!